The terms bid and ask are commonly used in the stock markets. They are both two-way price quotations which indicate the best amount at which the listed security can be bought or sold at that particular point in time. An ask price which is also known as offer is minimum price that the seller would want to receive for the security being exchanged. The bid price is the maximum amount a buyer can pay for the listed security. Exchange of ownership of the security involved can only take place once both parties agree on the price. The difference between the offer and the bid price is called a spread. This spread determines the liquidity of the security involved. A higher spread value means the security is has less liquidity, while a lower spread indicates higher liquidity. A bid is the highest amount a buyer is able to pay at that point in time for a security on sale. The bids posted for a security are displayed Level I and Level II tools. Level I provides basic information about the bid price. Level II provides much more details on the bid amounts and gives the range from the lowest to the highest amounts. It also provides details concerning the number of shares that are being bid on and their bid amounts. When a bidder places a bid, it is not guaranteed that the number of contracts, shares or lots he needs will be received. Every transaction in an open market requires both the seller and the buyer to agree to transact and have a binding contract. If there is a bid on a stock for $11.02, traders can place bids at the same price or lower. If one places the bid at $11.00 all other bids above that amount will have to be fulfilled before the $11.00 order is met. 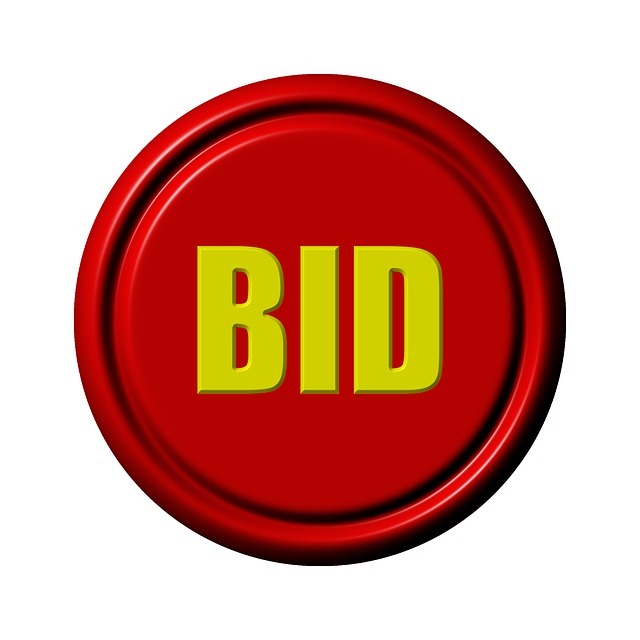 Bids that are above the current bid amount are usually satisfied instantly. Sellers who would want to exit a position in the market can sell the securities at the current bid amount. Buyers have three options, bidding at the current bid, lower or using market orders. Market orders usually takes any price available to find a trader who is willing to sell in order to get into or out of a certain market position. An ask price is the amount a seller is willing to take in exchange of a security within that point in time. It is a fair indicator of the stock value, however it can’t be taken as the actual true value of the stock. Asks are also referred to as offers. These offers are presented on Level II tool used in the stock market. Just as the bids, it is not guaranteed that all offers will be met. A buyer must agree to take part in the trade. If there is security stock offer in the market is currently at $11.02, sellers can place offers at that price or higher as they please. In the case that an offer is placed at $11.04, the offers below that amount have to first be met before the price moves to $11.04 to fulfil that order. Offers that are below the price range say $11.02 in our case will be fulfilled instantly as the spread is lower. Buyers who would wish to take up the position instantly, they can purchase at the lower offer price, this will be fulfilled by a market buy order. Both Ask/offers and bids are only relevant at a given point in time. Due to the constant changes in market prices that are affected by different forces, the ask and bid amounts can’t remain constant over time. They are both only relevant in the stock markets during the exchange processes. They can both be used to determine value of a stock price, this however can’t be taken as the actual stock value. They are both used to value the liquidity of a security. 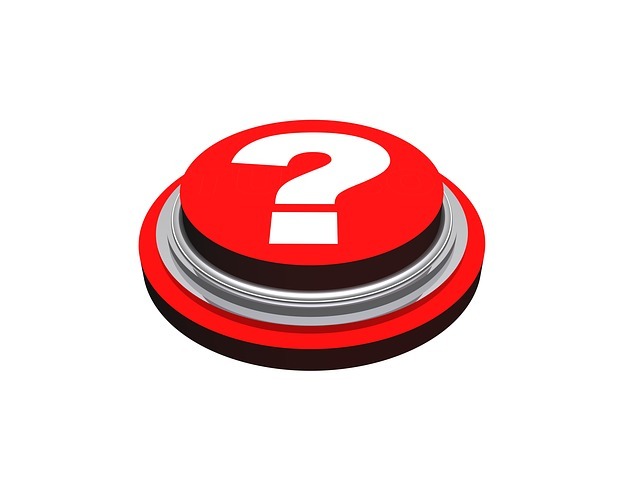 An ask or offer is the amount a seller is willing to take in exchange of a security at a given point in time. A bid is the maximum amount of money a buyer is willing to part with to get a security listed. Offers/Ask prices are made at the current offer price or higher than the amount. Bids are made at the current market bid price or lower. Asks or offers are done by sellers while bids are made by buyers. Bids and asks are terms used in the stock exchange markets. The other word for ask is an offer. An ask is the amount a seller would want for the exchange of a security. A bid is the amount a buyer can pay for a security in the market. Both bids and offers are listed in the Level 1 and level 2 tools of the stock exchange. Buyers make bids at a lower price or at the same market rate. Sellers make offers at a higher rate or at the current listed offer amount. Market orders are the selling or buying orders that have to be fulfilled immediately at the given prices. These are often used when the buyers or sellers want to quickly exit a currently held market position. Evah Kungu. 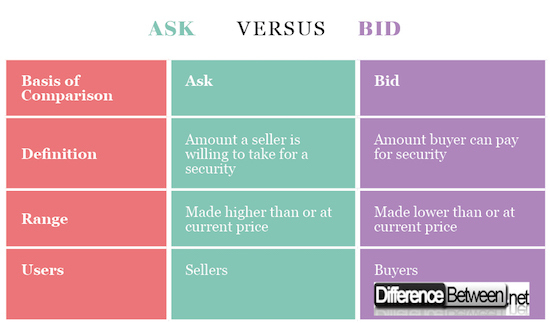 "Difference Between Ask and Bid." DifferenceBetween.net. May 17, 2018 < http://www.differencebetween.net/business/difference-between-ask-and-bid/ >. Karimov, Azar. Identifying Stock Market Bubbles: Modeling Illiquidity Premium and Bid-Ask Prices of Financial Securities. Springer, 2017. Cagan, Michele. Stock Market 101: From Bull and Bear Markets to Dividends, Shares, and Margins—Your Essential Guide to the Stock Market. F+W Media, Inc., 2016. Klein, Lawrence R., et al. Regulating Competition in Stock Markets: Antitrust Measures to Promote Fairness and Transparency through Investor Protection and Crisis Prevention. John Wiley & Sons, 2012.